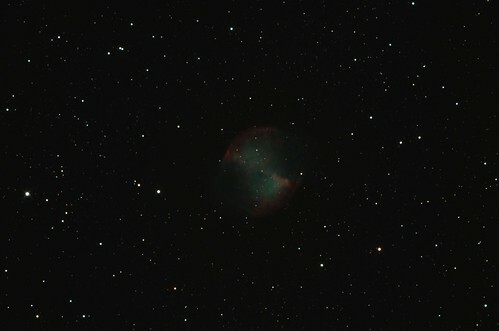 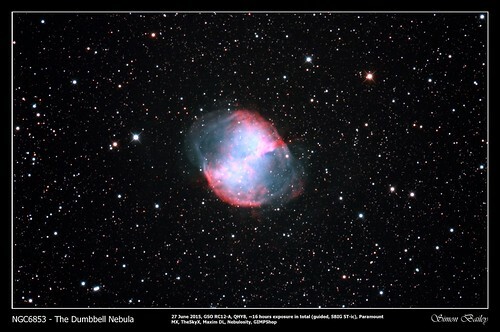 The Dumbbell Nebula (also known as Apple Core Nebula, Messier 27, M 27, or NGC 6853) is a planetary nebula in the constellation Vulpecula, at a distance of about 1,360 light years. The central star, a white dwarf, is estimated to have a radius size larger than any other known white dwarf. Taken with a GSO RC12-A on a Paramount MX, off-axis guiding with an SBIG ST-ic, approximately 16 hours exposure using Nebulosity. 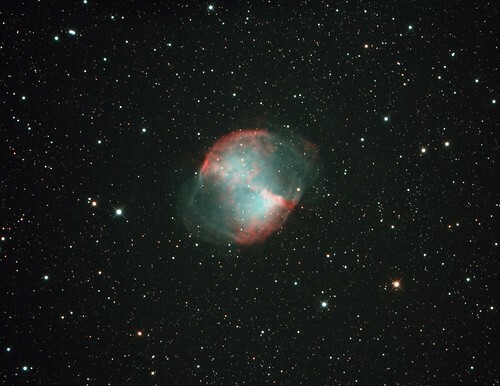 Post processing with MaximDL, Nebulosity and GimpShop on Ubuntu.